Learn to manage your prospects data, watch campaign outcomes by prospect, updates statuses, create smart filters and export custom lists. The People tab lets a user see the information and metrics about contacts participating in the campaign, manage, add and remove them from the campaign. The preset filters help you quickly sort the contacts by their status: All, Opened, Replied, Bounced, Opted Out. Steps on the left side of the tab let you sort the contacts depending on the step they have already passed. For example, if a contact has received both Step 1 and Step 2 emails, they will be displayed both in the Step 1 and Step 2 lists. You can adjust columns to see additional information about the contacts by clicking on the More (...) icon. There are two columns that look similar, but have different explanation - OPENS and VIEWS. The OPENS column shows a unique number of emails opened, so each email opened is counted only once. The VIEWS column displays how many times each particular email was viewed by the recipient. For more information about the columns, see the How Do I read Columns on the People Tab article. When you select one or more contacts, you can perform several actions to them, such as changing their status, moving to another campaign etc. Note: you can add the Current step column that shows the current step of a contact. To add contacts to the campaign, click the Add button at the top right corner of the People tab. For more information, see the Add Contacts article. Select contacts you want to remove by checking their check boxes. Click the Remove from campaign button. Click Create new filter. This opens the New smart filter dialog box. In the Filter name field, enter the name of the filter. In the Property field, select the Added on value. In the Condition field, select the Exactly value. In the numeric field, enter 5. 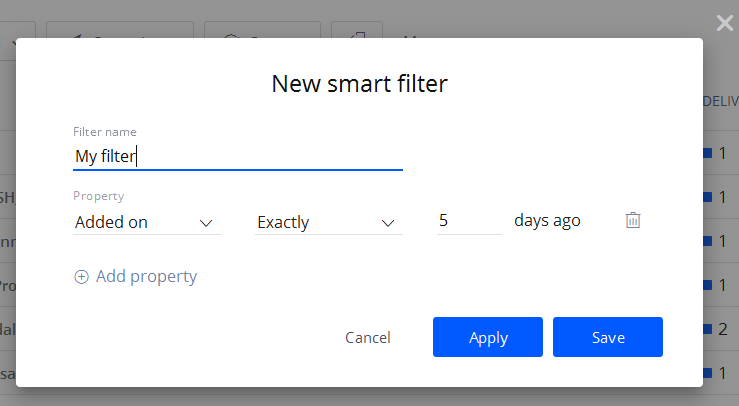 Now you can see the custom filter in the Smart Filters area. Note: You can add several properties to a custom filter. Select contacts you want to change status by checking their check boxes. Click the Set campaign status button. Note: there are certain restrictions on changing contact statuses. For more information, see the Contact Statuses article. Select contacts you want to export by checking their check boxes. Click the More button and select Export to CSV. You can pause the campaign by moving the Active/Paused slider at the top right corner of the tab. You can select a contact or multiple contacts on the People tab and add them to a list.